Qualification: B.Sc (Engineering) Second Class. Experience: 08 years experience of construction/maintenance of buildings, roads and civil services in BPS-17 or above in a government department/autonomous organisation or in an equivalent responsible position in a private concern of repute. Qualification: B.Com. Experience: Atleast 05 years experience of accounts/audit in a University/government department/semi government organisation. Qualification: Master’s Degree (atleast in 2nd Class). Experience: Atleast 4 years’ experience in the field of Course production. Experience of working in a research based organisation desirable. Qualification: Master’s Degree in Urdu atleast in Second Class (relaxable in special cases), with adequate knowledge of Persian/Arabic. Experience: Preferably 3 years experience in the field of editing Urdu text for publication and some knowledge of design and print production techniques. Qualification: Master’s Degree in English atleast in Second Class (relaxable in special cases). Experience: Preferably some experience in the field of editing English texts for publication and some knowledge of design and print production techniques. Qualification: (i) 2nd Class Master’s Degree (ii) Participation in curricular activities desirable. Qualification: Second Class Master’s Degree or equivalent qualifications in the subject concerned. Experience: Research experience in the relevant field desirable. Experience: Five years’ experience as Assistant/Stenographer in a government department or autonomous organisation. Qualification: Master’s Degree. Experience: Desirable: (1) Sound literacy background. (2) Association with Radio/TV programmes as script-writer. (3) Knowledge/experience of educational broadcasting. Qualification: B.Sc or 3 years Diploma in Electronics from a recognised Polytechnic Institute. Experience: 2 years experience as Television/film Cameraman. Qualification: Intermediate Experience: Stenographic work 100/45 w.p.m. speed in English Shorthand/Typing. Qualification: Bachelor’s Degree with Post-Graduate Diploma in Computer Science. Experience: One year’s Computer Training at a University. Qualification: 2nd Class Graduate with Certificate Course in any one computer language. Experience: Two years experience of computer with aptitude test. The knowledge of RPG-II language will be considered extra qualification. Experience: 5 years experience in operating of cameras; video and film recording. Relaxable in special case. Qualification: Diploma in Civil Engineering from recognised Institution. Experience: 2 years experience of construction/maintenance of buildings/roads and civil services or other work in the relevant field as Overseer in a government department/autonomous body or in an equivalent position in a private concern of repute. Qualification: 2nd Class Graduate with Certificate Course in any one computer languages. Experience: 06 years experience of Computer with aptitude tests. Qualification: Atleat 2nd class Bachelor’s Degree with Statistics as an elective subject. Second Class Master’s Degree in Statistics, Education or Sociology desirable. Qualification: Intermediate with Certificate in Librarianship/Library Science. Qualification: Graduate with Certificate in Librarianship/Library Science. Qualification: BLS/BLIS/diploma in Library Science. Qualification: Intermediate must qualify the aptitude test and possess typing speed of 45 w.p.m. Experience: One year’s experience on punching machine. Qualification: SSC or equivalent (preferably Intermediate). (ii) 3 years experience of security or relevant field preferable. Experience: 5 years experience as Store-Keeper in a Scientific Department of a government/ autonomous organisation. Qualification: Secondary School Certificate 2nd Class. Certificate in Make-up-Arts from a reputable Institute. Experience: 2 years experience of Make-up- at TV or film Studio. Qualification: Matriculation or Proficiency in one of the oriental languages atleast in Second Class (Relaxable in case of proven efficiency). Experience: 03 years experience of working as a Calligraphist in a government department, autonomous body or reputable commercial concern, newspaper or magazine. Qualification: Second Class Matriculate. Experience: 3 years clerical experience with Computer Typing Speed of 30 w.p.m. Qualification: F.Sc. Experience: 3 years experience as a store keeper in a government department/autonomous body. Experience in maintaining store ledgers/stock record. Experience: 03 years experience as Laboratory Attendant. Experience: Preferable in case of experience as Assistant Machineman in a government or a reputable private printing industry. Experience: Computer Typing Speed of 30 w.p.m. Experience: Experience of proof reading and some working knowledge of printing process and publishing establishment will be given preference. Qualification: Driving Licence in Heavy Vehicles. Experience: 3 years driving experience. Experience: 5 years experience in Plumbing in a government department, autonomous organisation/private organisation. Qualification: Literate, preferably with a certificate in the trade from a recognised institution. Experience: 05 years professional experience. Qualification: Middle standard with some know how regarding television production. Experience: 3 years experience as Helper in T.V Film or Radio Studios. (Candidates having experience of working in relevant organizations will be preferred). Qualification: Literate. Preference will be given to Ex-service men. Qualification: Master’s Degree with Diploma in Printing & Graphic Arts. Experience: At-least 17 years experience in Print Production/ Publication or Publishing in a Government Department, Autonomous body or in a Commercial concern of high repute with substantial administrative responsibility. Experience: 17 years’ experience as Programme Manager/Controller of Programmes/Producer in Radio/Television or equivalent post in the audio-visual centres of Education Department or other relevant organisation, with practical experience in programme production and management. (4) Published work and, portfolio of (creative/research). Qualification: Second Class Bachelor Degree. Experience: Preference will be given to candidates with 3 years experience of field work. Qualification: Second Class Intermediate. Computer Typing Speed of 30 w.p.m. Qualification: Literate, preferably with a certificate in the trade from a recognised institution. Experience: 5 years experience. 1. The candidates may download applications and challan forms from AIOU Website (www.aiou.edu.pk) and apply ONLINE. 2. It is mandatory for the candidates applying for the positions of BPS – 7 and above to submit their applications ONLINE followed by hardcopy along-with the original challan form through which the processing fee is deposited. 3. 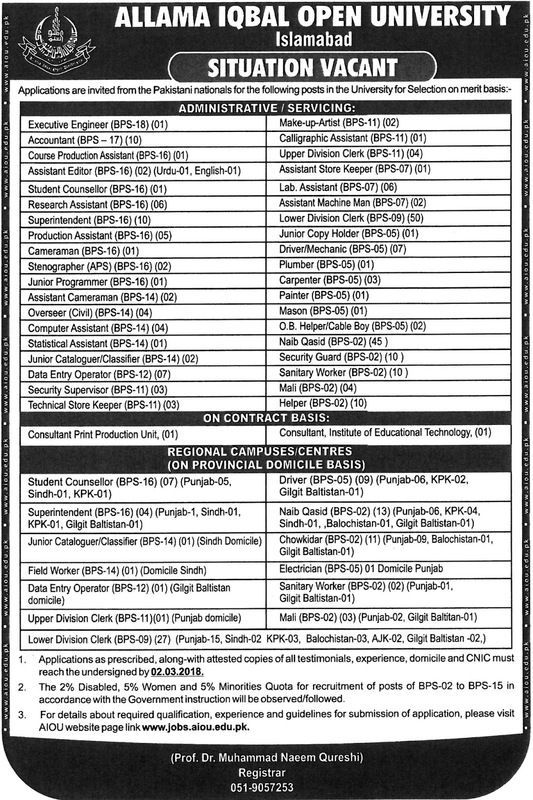 For detail about required qualification and experience for the above posts, visitwww.aiou.edu.pk in AIOU Jobs. 4. The candidates for the posts of BPS – 6 and below are required to submit their applications in hard form; however they can also apply in both formats hard form and on-line if convenient. 6. The Demand Draft, Pay Order, Cheques, Postal Orders etc. wil not be accepted as mode of payment on account of processing fee. The application forms without processing fee shall not be considered/entertained. 7. The University reserves the right to shortlist the candidates. Only shortlisted candidates will be called for tests/interviews. 8. The University reserves the rights to increase/decrease the number of posts or not to fill any post/withhold the appointment against any post. 9. Applicants already working in Government/Semi Government Organizations/ Autonomous bodies should apply Through Proper Channel by due date and submit service certificates issues by their present and former employers. 10. The University will follow age limits as prescribed by the Government of Pakistan. However, the applications of Overage Daily Wages Employees of the University will be considered/entertained as per Federal Government Policy, 2017. 11. The candidates applying for the post must enlist the attached documents with signature. Incomplete or applications received late will not be entertained. 12. Applicants lacking prescribed criteria and required qualification on closing date will not be entertained (required terminal degree/experience must be completed on closing date). BPS-02 to BPS-15 in accordance with the Government instruction will be observed/followed. 14. No TA/DA will be admissible to the candidates called for test/interview. 15. Candidates having Open Distance Learning Experience (ODL) will be preferred. 16. Applications as prescribed, along-with attested copies of all testimonials, experience, domicile and CNIC must reach the undersigned by 02.03.2018.